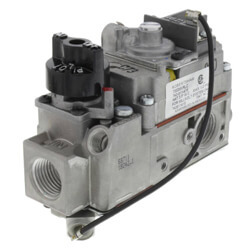 Gas valves regulate the flow of fuel to gas-powered appliances. 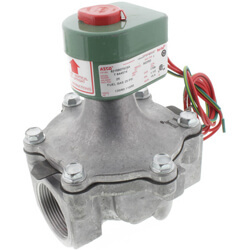 Look here for gas valves from Honeywell, Robertshaw, Baso, and White Rodgers. 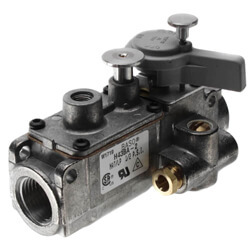 Gas valves are used to regulate natural gas or liquid propane in heating systems. Gas valves vary in capacity (cubic ft of gas), inlet/outlet size, and type (standing pilot, slow opening, and step opening). Gas valves and controls must match the heating system's fuel type. Liquid propane and natural gas conversion kits are available if the valve must be converted to meet a system's requirements. After the system type is verified, the system's capacity must be determined. 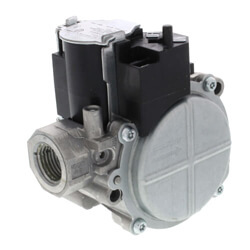 Whether a normally open or normally closed gas valve is selected depends on the expected usage frequency of the valve. 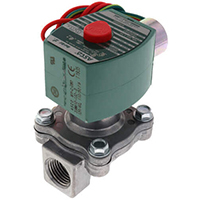 A solenoid valve uses a solenoid to actuate the valve. This allows the flow of water, gas, or air to be controlled with electricity. A solenoid is a coil of wire that becomes magnetized when an electric current passes through it. 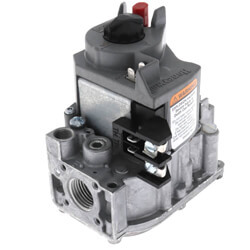 Solenoids often have a hole in their center and a protruding metal rod that is pushed or pulled by magnetism when power is applied. Solenoid valves are best for continuous on/off cycling. We carry a wide selection of Honeywell SmartValves, White Rodgers, Asco-RedHat, and Robertshaw gas valves & controls to suit all of your heating needs.